These days I'm porting it for the new Universal Windows Platform, so it means that it should be working on Windows Phone too. Please, let me know your feelings about it. Fantastic News. I hope it will work. Are you going to bring it to the Windows Store? Thank You. I tried: Day of The Tentakel, Indiana Jones 4, Eye of the Beholder, Kings Quest 1-4, Monkey Island 1, Simon the Sorcerer 2, Conquest of Camelot. AlexR wrote: Thank You. I tried: Day of The Tentakel, Indiana Jones 4, Eye of the Beholder, Kings Quest 1-4, Monkey Island 1, Simon the Sorcerer 2, Conquest of Camelot. I'm sorry to tell you that only SCUMM games are supported, Eye of the beholder, Kings Quest 1-4, Simon the sorcerer 2 and Conquest of Camelot won't be available, but Day of the Tentakel, Indiana Jones 4, Monkey Island 1 will be supported in german in the next release. I added support for german, french, italian and spanish. Thank you scemino. I tried the english version of Monkey Island1. It was really good to see it starting. Unfortunatly there was no sound. But maybe it is a Win10 mobile bug. There are a few problems with the sounds in last build of the OS. Edit: The english dos version stopped at the end of the intro. But it's how i said. Win10 is not really stable on Lumia 930. I think it's about the testing people in the Windows insider program. They all tested the preview on cheap Lumias and not on their main smartphones. Most of the bugs happens on the flagships at the moment. Don't hurry. We will see if it works in the future. Seeing the intro of Mi1 on my lumia was great enough waiting for it. Thank you for this. By the way the german versions of Mi1 are Amiga and Atari Version. I hope this is no problem. Great to see ScummVM in WM Store. As you wrote only english games are working until now. Thanx for working on german games support also. One general question: It seems there is no way yet to control the game over the buttons of my mobile phone, right? @scemino I'm delighted to see your work and installed it immediately from the store (after having downloaded from GIT, compile myself, then noticing few posts later it was in the store...) Great! 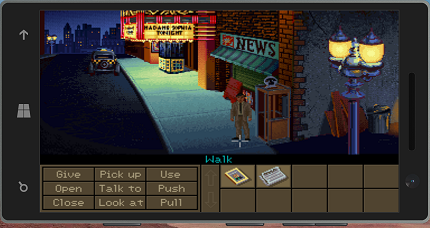 I'm interested in you adding support for the English CD versions of a couple of games, "Indiana Jones and the Fate of Atlantis", and "Beneath a Steel Sky". Is it only on windows phone 10? I read that Lybra is working on 8.1 and some people who've downloaded it from the store but I'm not finding it (Lumia 830 on w8.1)...? I am working on the Universal App port (Win10 only).